^ a b Shoshani, J. (2005). 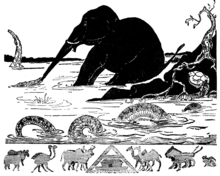 "Order Proboscidea". In Wilson, D. E.; Reeder, D. M (eds.). Mammal Species of the World: A Taxonomic and Geographic Reference, Volume 1 (3rd ed.). Johns Hopkins University Press. pp. 90–91. ISBN 978-0-8018-8221-0. OCLC 62265494. ^ a b Rohland, N.; Reich, D.; Mallick, S.; Meyer, M.; Green, R. E.; Georgiadis, N. J.; Roca, A. L.; Hofreiter, M. (2010). Penny, David (ed.). 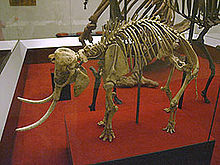 "Genomic DNA Sequences from Mastodon and Woolly Mammoth Reveal Deep Speciation of Forest and Savanna Elephants". PLoS Biology. 8 (12): e1000564. doi:10.1371/journal.pbio.1000564. PMC 3006346. PMID 21203580. ^ a b Ishida, Y.; Oleksyk, T. K.; Georgiadis, N. J.; David, V. A.; Zhao, K.; Stephens, R. M.; Kolokotronis, S.-O. ; Roca, A. L. (2011). Murphy, William J (ed.). "Reconciling apparent conflicts between mitochondrial and nuclear phylogenies in African elephants". PLoS ONE. 6 (6): e20642. Bibcode:2011PLoSO...620642I. doi:10.1371/journal.pone.0020642. PMC 3110795. PMID 21701575. ^ Carpenter, K. (2006). "Biggest of the big: a critical re-evaluation of the mega-sauropod Amphicoelias fragillimus Cope, 1878". In Foster, J.R.; Lucas, S.G. (eds.). Paleontology and Geology of the Upper Jurassic Morrison Formation. New Mexico Museum of Natural History and Science Bulletin. 36. New Mexico Museum of Natural History and Science. pp. 131–138. ^ Hutchinson, J. R.; Delmer, C.; Miller, C. E.; Hildebrandt, T.; Pitsillides, A. A.; Boyde, A. (2011). "From flat foot to fat foot: structure, ontogeny, function, and evolution of elephant "sixth toes"". Science. 334 (6063): 1699–1703. Bibcode:2011Sci...334R1699H. doi:10.1126/science.1211437. PMID 22194576. ^ K.S. Rajgopal (4 September 2013). "The dental factor in elephant evolution". The Hindu. ^ a b c Shoshani, pp. 71���74. ^ Chiyo, P. I.; Obanda, V.; Korir, D. K. (2015). 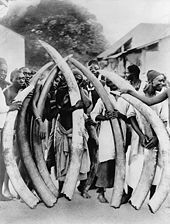 "Illegal tusk harvest and the decline of tusk size in the African elephant". Ecology and Evolution. 5 (22): 5216–5229. doi:10.1002/ece3.1769. PMC 6102531. PMID 30151125. ^ Jachmann, H.; Berry, P. S. M.; Imae, H. (1995). 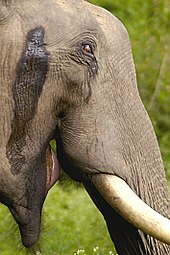 "Tusklessness in African elephants: a future trend". African Journal of Ecology. 33 (3): 230–235. doi:10.1111/j.1365-2028.1995.tb00800.x. ^ Kurt, F.; Hartl, G.; Tiedemann, R. (1995). "Tuskless bulls in Asian elephant Elephas maximus. History and population genetics of a man-made phenomenon". Acta Theriol. 40: 125–144. doi:10.4098/at.arch.95-51. ^ Vaughan, T.; Ryan, J.; Czaplewski, N. (2011). Mammalogy. Jones & Bartlett Learning. p. 136. ISBN 978-0763762995. ^ Slotow, R.; van Dyk, G.; Poole, J.; Page, B.; Klocke, A. (2000). 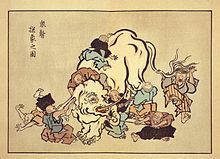 "Older bull elephants control young males". Nature. 408 (6811): 425–26. Bibcode:2000Natur.408..425S. doi:10.1038/35044191. PMID 11100713. ^ O'Connell-Rodwell, E.O. (2007). 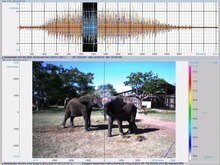 "Keeping an "ear" to the ground: seismic communication in elephants". Physiology. 22 (4): 287–94. doi:10.1152/physiol.00008.2007. PMID 17699882. Archived from the original on 27 January 2016. 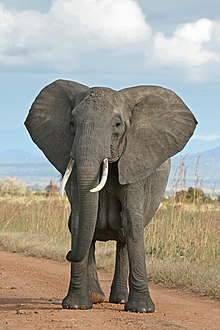 ^ "African elephant conservation". www.traffic.org. Retrieved 10 January 2019. ^ a b c d e f g Choudhury, A.; et al. (2008). 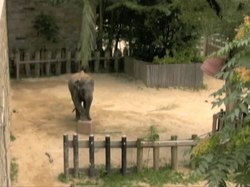 "Elephas maximus". IUCN Red List of Threatened Species. Version 2012.2. International Union for Conservation of Nature. Retrieved 16 October 2012. ^ Hicks, Celeste (19 March 2013). 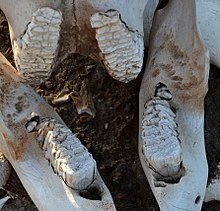 "86 elephants killed in Chad poaching massacre". The Guardian. Retrieved 23 September 2015. ^ Thomas Fuller (30 January 2016). "Unemployed, Myanmar's Elephants Grow Antsy, and Heavier". New York Times. Retrieved 31 January 2016. ^ Roger Lohanan (February 2001). "The elephant situation in Thailand and a plea for co-operation". FAO. Retrieved 31 January 2016. ^ a b Griffin, B (2004). "Elephants: From the Sacred to the Mundane". In Gin Ooi, K. (ed.). Southeast Asia: A Historical Encyclopedia, from Angkor Wat to East Timor, Volume 1. pp. 487–89. ISBN 978-1-57607-770-2. ^ Cambridge Academic Content Dictionary Paperback with CD-ROM. Cambridge University Press. 3 November 2008. p. 298. ISBN 978-0-521-69196-3.